Among the many reasons I love working on this blog is the rush of excitement that comes when I discover a hidden “gem” that I know will enrich the treasure box that is Ursula’s story. I experienced such a moment after finishing my May 19 post on Ursula’s time studying at opera star Emma Calvé’s castle in southern France. At that time, I decided to cast one more line of inquiry into the “intergoogle,” not expecting much in return. I was curious to see if there were any written accounts by one of Madame Calvé’s other “young songbirds” of that period—perhaps in the memoirs of someone who found later fame. Lo and behold, my search returned a result that indicated Ursula, herself, had written a report of studying with Madame Calvé and traveling abroad! It was published in her sorority’s quarterly journal, Themis of Zeta Tau Alpha. I couldn’t believe my luck! I clicked on the link, but was frustrated to find that I couldn’t access the journal online. I dug around a little more and found that there was one available copy of the journal—in a library storage facility located at the University of Michigan. So, I contacted my local public library and arranged to receive a digital copy of the report via interlibrary loan. A couple days later and voilà!—a digital scan of the article appeared in my e-mail inbox. My heartbeat quickened as I clicked on the PDF. And then there they were: Ursula’s own words, painting a vivid portrait of her glorious time in France and beyond. I was elated, and felt almost like I was being reunited with a long-lost friend. I will post Ursula’s story in three parts, with part one (below) covering her departure from the United States and arrival in France, and her experience of Paris before journeying south; part two (next Tuesday—special edition of Mystery Dancer!) describing her time studying at Château Cabrières; and part three (another special edition, on June 30), covering her European travels with Mme. Calvé and the other “songbirds.” Enjoy! 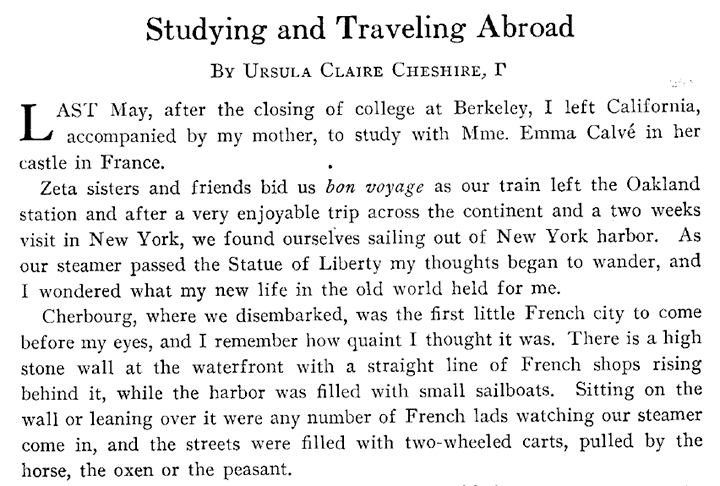 “Last May, after the closing of college at Berkeley, I left California, accompanied by my mother, to study with Mme. 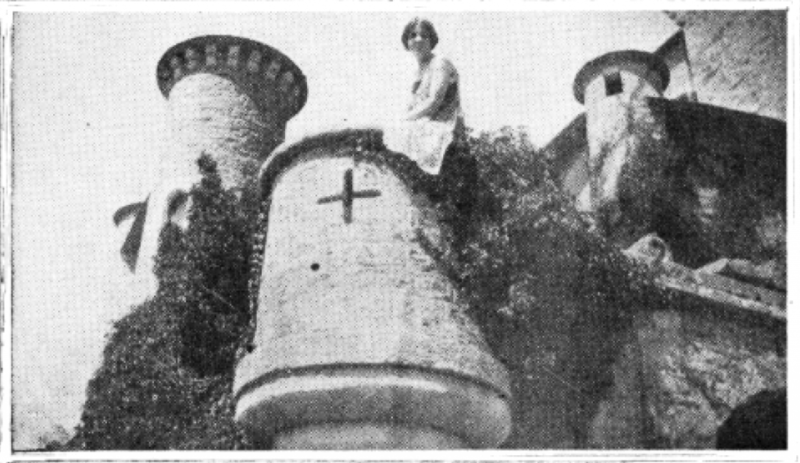 Emma Calvé in her castle in France. Zeta sisters and friends bid us bon voyage as our train left the Oakland station and after a very enjoyable trip across the continent and a two weeks visit in New York, we found ourselves sailing out of New York harbor. As our steamer passed the Statue of Liberty my thoughts began to wander, and I wondered what my new life in the old world held for me. Cherbourg, where we disembarked, was the first little French city to come before my eyes, and I remember how quaint I thought it was. There is a high stone wall at the waterfront with a straight line of French shops rising behind it, while the harbor was filled with small sailboats. Sitting on the wall or leaning over it were any number of French lads watching our steamer come in, and the streets were filled with two-wheeled carts, pulled by the horse, the oxen or the peasant. After a long ride on the small French train with its many compartments, through the beautiful open country of Normandy with its fields of wheat and red poppies, we arrived at Paris to the ‘toots’ of taxi horns—and I thought ‘so this is Paris,’ as many others have thought before me. The buildings are not high like our American skyscrapers but what they lack in height they make up for in beauty, for they are all decorated. This entry was posted in Uncategorized and tagged antique photos, Château Cabrières, Cherbourg, Emma Calve, family history, family photos, France, genealogy, history, New York, Oakland, Paris, Themis, UC Berkeley, ursula cheshire, zeta tau alpha by lizross325. Bookmark the permalink. This is amazing that you found Ursula’s travelogue! HOW COOL! Excellent research, Liz! Thanks, Jeneve! It was quite a find.